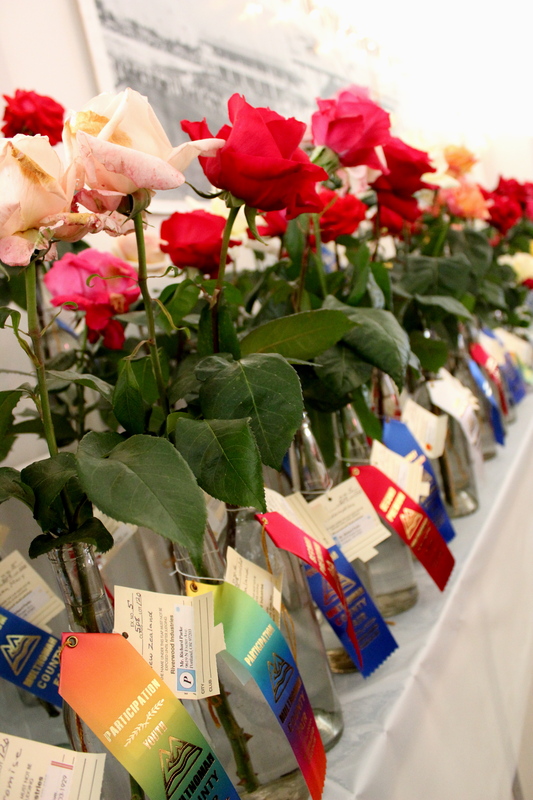 I entered a Strawberry Rhubarb Pie in the Multnomah County Fair. So I guess entering pie competitions is my things now. This weekend I entered in my 4th, and I’m defending my title. Last year during my first entry in a pie contest, I won “Best Pie” at the Multnomah County Fair, snapping up 2 ribbons and a $16 prize. So I decided to go try again, defend my title with another entry. This whole thing started at my grandma’s funeral service last year. During the service it was revealed that she used to enter rugs in the county fair. I don’t know why but I found this so inspiring and fascinating. I felt like I knew my grandmother pretty well, but I didn’t know that about her. I think it may have been something she did before I was even born, but I thought it was so cool. She never seemed like a competitive person at all, but this was a different side. So I started thinking… what could I enter in a fair? My only real big hobby is baking, so I decided to try a pie. The first year I had planned and practiced and perfected my recipe for Strawberry Rhubarb. It’s the perfect springtime pie. But at the last minute, I did something stupid…. and ended up destroying it! It was a rough few minutes for me as I grappled with what to do… throw in the towel? Or rebuild? I chose to rebuild and scraped together a raspberry pie from left over crust dough and some berries my friend David had in his fridge. Low and behold that pie I threw together… won!! 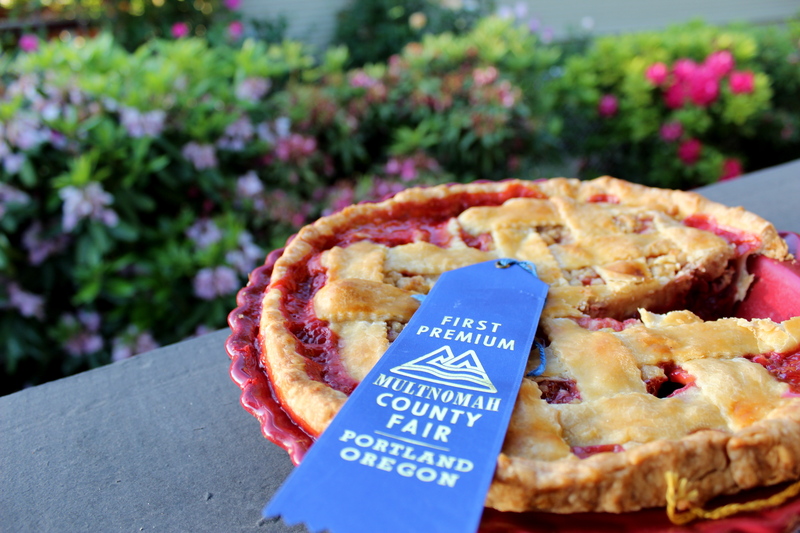 Coming home with two ribbons, a $16 cash prize and the title of “Best Pie in Multnomah County”. So this year I had to try again, and this time I returned to the original Strawberry Rhubarb recipe. Learning from my mistakes I made two pies, just in case something went wrong. Nothing did, but I was able to chose the better looking of the two. I used fresh Oregon strawberries from the Portland Farmer’s Market and my favorite crust. We dropped the pie off Friday night and enjoyed the spare pie all weekend long, it was fresh and delicious. 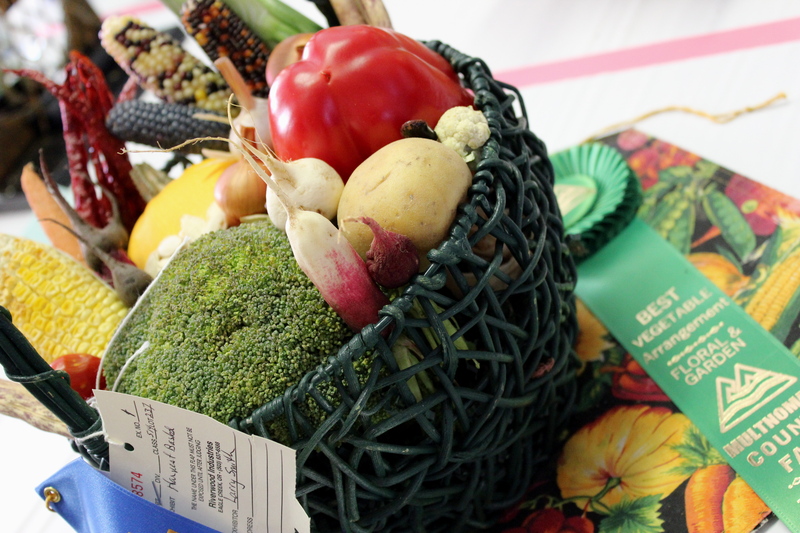 And it won a Blue Ribbon! I didn’t win Best in Show this year but I won best berry pie, which is good enough for me. The recipe is below but I might decrease the cornstarch a little. The judges main complaint was that it was a little gummy. Mix the flour, sugar and salt in the bowl of a stand mixer. With the mixer on low, drop the butter by the tablespoon into the flour. Beat until the flour and butter create a course mixture. Add the water slowly, just until the dough comes together. Wrap in plastic wrap and store in fridge until ready to roll. To make the filling, combine all the ingredients in a bowl and set side. To make the crumble melt the butter then mix in all the dry ingredients until it becomes a course mixture. To assemble roll out half the dough to about 1/4 inch thick, transfer to pie plate and press dough into the plate. I like to dust the bottom with a little sugar and flour. Then spoon the strawberry mixture into the crust straining out extra juices if you can. Top with the crumble. Then roll out the second crust. I like to cut it into a lattice or you can just make a full size top crust. Crimp the edges together and brush top with an egg and water mixture. Place pie on a cookie sheet and bake for 20 minutes. Reduce temperature to 350 degrees and bake for an additional 25 to 30 minutes until the crust is golden brown an the juices are bubbling. Congratulations on your latest win!! I’m sure your grandmother is really proud that you’ve taken up the gauntlet even if it’s in pies!